Having arrived from Kyushu in Ube, Yamaguchi-ken, I went to seek out a bicycle shop to get the front gear shifter cable exchanged. The first shop I went to refused me the moment I walked into the door: „we are closing tomorrow for the holidays, can’t help you no matter how easy the problem, our boss is not here, blablabla“. As I was about to depart, the shop assistant happily told me about their cycling plans for the next day, admired my bike, wanted to know how the Selle SMP saddle was, etc. Unbelievable – either you have time for me or you don’t! I went to the next shop where I was not turned away completely, but asked to come back in the afternoon. So I did and the owner became increasingly friendly as we chatted. He knew my bike was very rare in Japan and that Cadell Evans won the World Championship on a Canyon – which led to the suggestion that one day I might also become a champion… Well, he was delighted when I told him I was already one. He didn’t want to let me go any more, even after all the fixing had been done. 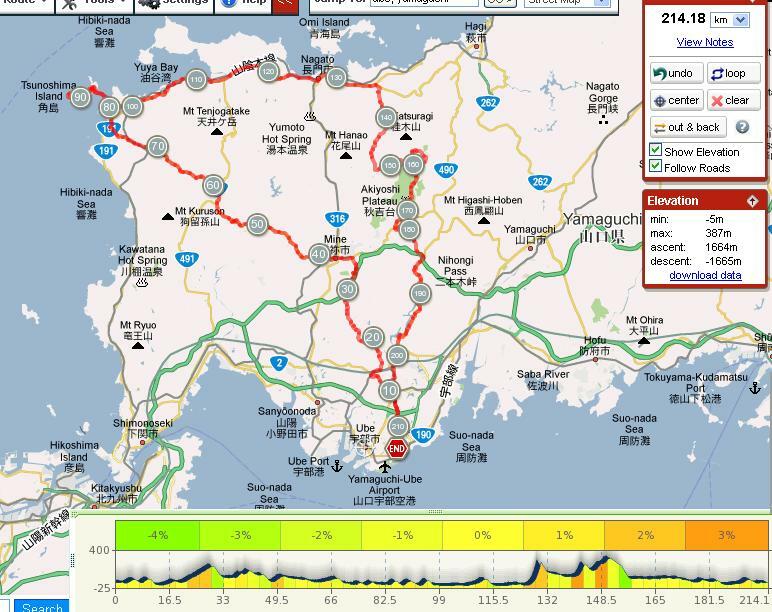 I learnt that while there were road-racer cyclists in Yamaguchi-ken, they wouldn’t normally do more than 50-100km and there were hardly any races. He had a sparse selection of road racers in the shop, mostly with Shimano Sora components. The highest grade bike on sales was a Pinarello with Ultegra 6600 components. I asked him what he was riding and he showed me his new Anchor carbon racer with 6700 components. Maybe he had the best bike in the entire prefecture. As it turned out, on my full-day ride through half of the prefecture the next day, I did not encounter a single cyclists (a few mamacharis not counted). I started out still in complete darkness at 6:40am, and at 1 degrees Celsius. It became brighter relatively quickly, but would stay clouded all day. The temperature slowly went up, reaching eventually 7 degrees and falling again in the late afternoon. Luckily it never rained, except for a few drops on the coast. I headed out of Ube through various backroads to reach Mine-shi (美祢市) after a bit over an hour. Unlike the name suggests, the town is terribly ugly, destroyed by huge cement refineries and mountains acting as open mines for them. The open mines reminded me of Chichibu-shi, but the good news was there were no dump trucks, because they had their own special road just for them connecting Mine and Ube. Maybe this is what we need in Kanto! 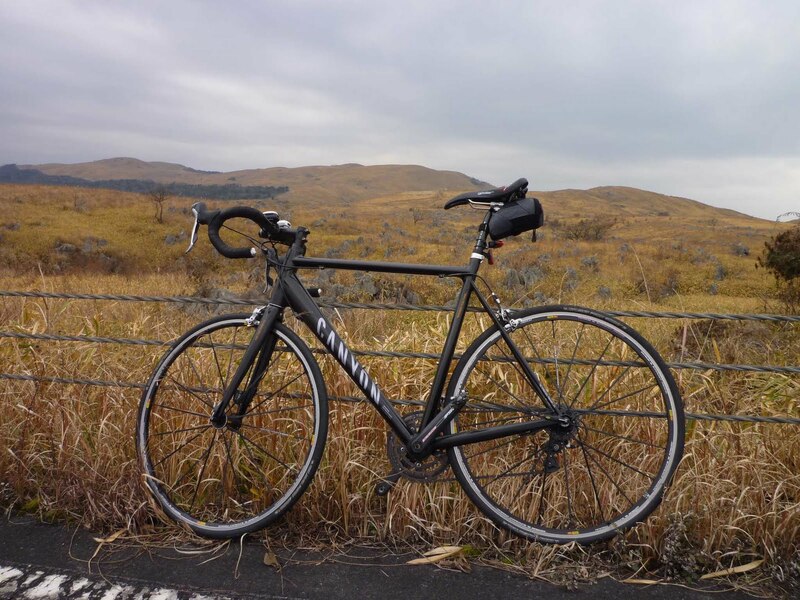 I rode the almost empty national highway number 435 all the way to the most north-western corner of Honshu. The roads were mostly built out gently and wide, and while there was really almost no traffic, there was construction for new bypasses and even faster and straighter roads. Crazy use of our taxes! 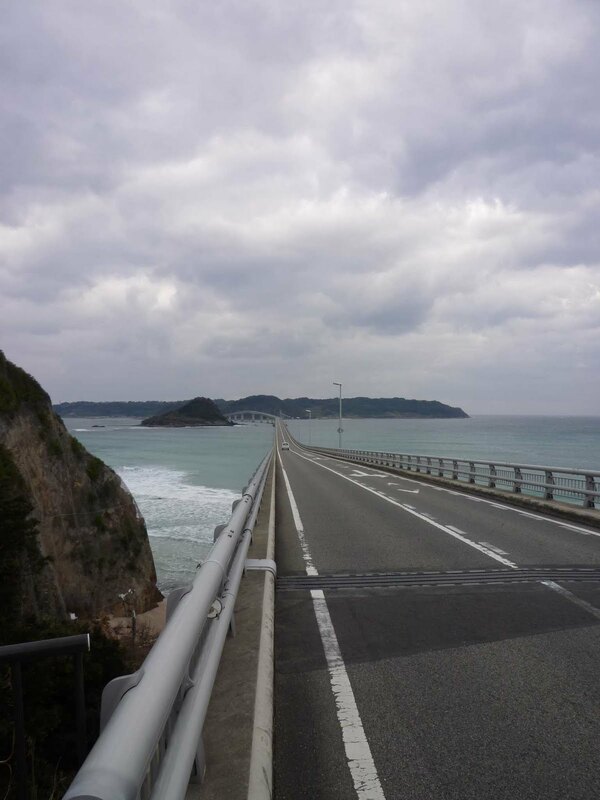 Craziest of all, however, is the 2km bridge that connects the northwestern tip of Honshu with a small island of 1,500 inhabitants – Tsunoshima. Having cycled once around the island and having convinced myself that there was really nothing that would merit spending so much of our money to save a few locals using a ferry, I cycled on national highway number 191 along the coast towards the east. Again built out widely, and with little traffic. The views of the coast and the islands and peninsulas in front of it were great. I sailed through the largest town in the area, Nagato, with nice backwind and the desire of getting away from increasing amounts of traffic. I then turned towards the inner land, cycling up another well-built out road with relatively little traffic leading through a very long tunnel. It was at this point that I started feeling no longer as fresh as I had during the first part of the ride. Maybe it was the high speed at which I had cycled – an average of 28km/h not counting photo and conbini stops -, maybe it was the cold air, or maybe it was the depression caused by seeing so much needless use of tax payers‘ money. The next climb up a pass with perhaps an altitude difference of 150m was painful. I then reached the northern entrance to the Karst Road leading over Akiyoshidai. Akiyoshido is the largest stalagmite cave in the world (and worth a visit – I have done that 14 years ago), Akiyoshido the karst landscape on top and beyond. The stunning views made me forget all pains and I felt again much fitter. Now it was only a matter of finding my way back to Ube. I was intent on avoiding bigger roads and wanted to take back roads, but that proved trickier than thought as my map didn’t show every road and the sign-posting was poor (or rather often none-existent). I ended up doing a circle of a few kilometers, and gave up on the idea of taking back roads. Which turned out to be just as well, as the national highway number 490 had very little traffic to speak of and lead me through a beautiful valley followed by a nice lake. Upon reaching highway number 2 I really felt the strains of the day, in particular in my upper back. Just another 20k! I somehow made it back to Ube through back roads and without any stops. The computer showed 216km in total for 8 hours on the bike, i.e. an average of 27km/h not including 2 hours off the bike. No major passes to climb, with the peak being Akiyoshidai at 387m, but still quite a bit of up and down and thus 1,600m of climbing in total. A nice discovery of about half of Yamaguchi prefecture.